We at The Hive Honey Shop are all very impressed with not only her technique and subject matter, but the creative detail and emotion her work contains are just breathtaking. So don’t miss your chance to see her work up close and personal! Londoners get down there, and if your planning to visit London, then add this must see to your list. Here is her artist statement about the exhibition. Breakfast – those first few moments of the day that are entirely yours. You have set your alarm; you know how long you need to shrug off the hazy cloak of sleep; and you know, most importantly, what is waiting in the fridge to fuel your body and keep hunger at bay. It is a time to ponder the new day and to realise that past worries are just that. It is a time for lazing in the bath, reading the morning papers, walking the dog, or pounding the deserted streets on an early jog. Control is yours. You are ahead of slumbering bodies, not yet stirred from their dreams. The honeyed aromas of melted beeswax fill the studio. 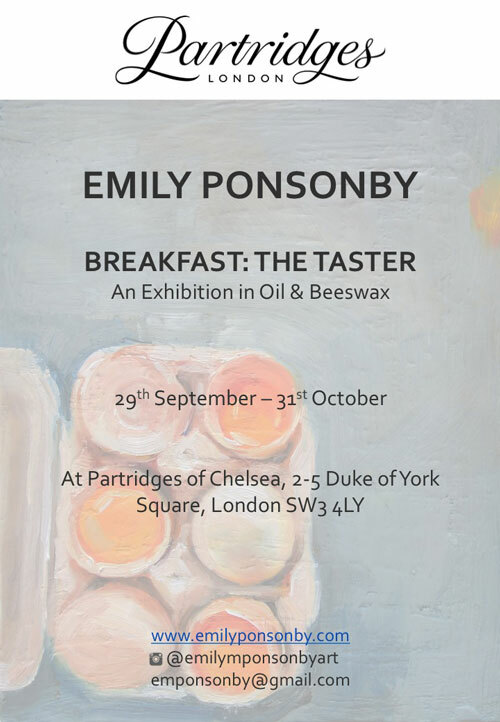 Thoughts of honey soaked, buttery toast devoured within that first hour of the day have become the driving force of Emily’s latest work. She sculpts, etches and buffs the oil into the beeswax, trapping and exposing forgotten layers as she does so, creating an unpredictability that gives the waxy paintings a life of their own. Returning from periods in Scotland, Italy and in the disappearing food markets of Hong Kong, Emily has set up life in London. 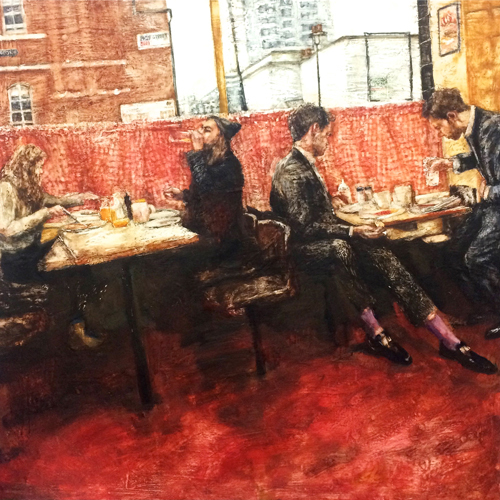 She has exhibited in group shows including The Royal Society of Oil Painters, The Society of Woman Artists, as well as in The Royal Scottish Academy in Edinburgh and Bristol at the Royal West of England Academy. She has also been short listed for the BP Portrait Awards. She is currently working towards her first solo exhibition in May 2017.